Yesterday I hit the gym for a lunchtime swim, and returned to my locker expecting a mobile inbox full of spam and work emails. While I was mostly right, I also found one of the most exciting press releases to cross my desk in months. It was the announcement for the inaugural Big Easy Running Festival this November! 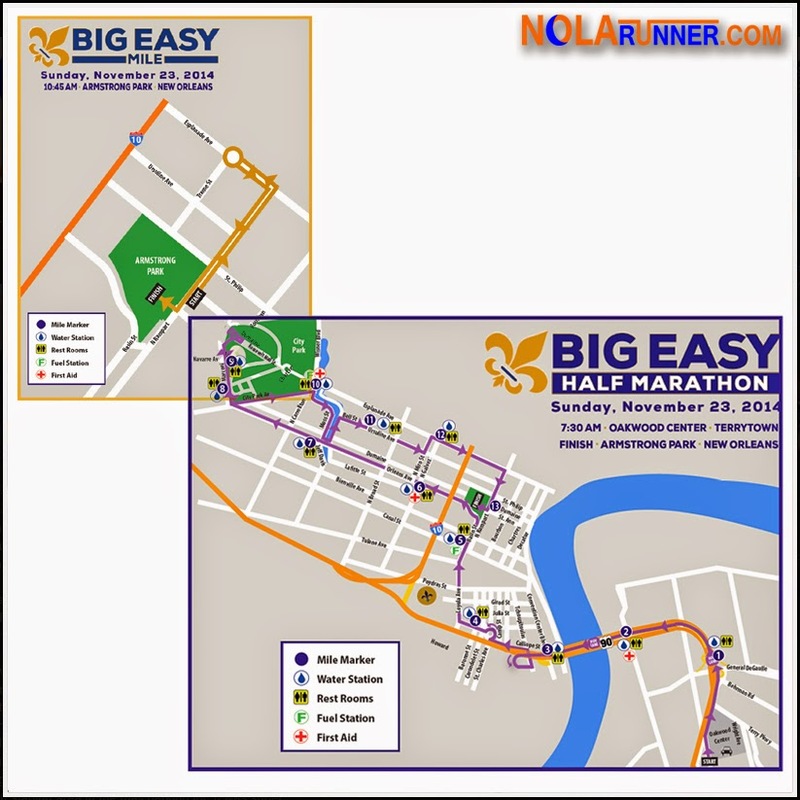 The Big Easy Running Festival will take place on Sunday, November 23, 2014 and will feature three races; the Big Easy Half Marathon, Big Easy Mini Marathon 4 Miler, and the Big Easy Mile. The half marathon will start on the Westbank, travel across the Crescent City Connection to downtown New Orleans, out to City Park and back for a finish in Armstrong Park. This course is drastically different than any other currently being used, and touches Lee Circle, the CBD, Treme, Bayou St. John, Esplanade Avenue and Rampart Street. I really didn't think a path like this was possible to pull off with the number of street closures necessary, but I'm stoked that it's going to happen! The Big Easy Mini Marathon 4 Miler will follow the last 4 miles of the half, and the Big Easy One Miler will follow a flat and fast out and back course on Rampart Street and Esplanade Avenue. For each, the start and finish will be in Armstrong Park where the post race festival will feature a performance from Cowboy Mouth! Race organizers are kicking off registration next Tuesday, June 17th at 10:00 a.m. CST with each race price starting at $1! Yes, you read that right. The Half Marathon, 4 Miler, and 1 Miler will each cost $1 for the first 50 registrants, the next 50 will be charged $5, the next 50 will be $10 and so on until it reaches the final registration price. For more details on the tiered-pricing structure, click HERE. Elite athletes have a chance to claim their share of a $25,000 prize purse that's split up in to multiple divisions, with local Louisiana racers having a shot at even more prizing. All participants in the Big Easy Half Marathon will receive a finisher's medal, while half and mini marathon participants receive a tech fabric shirt and Big Easy glass beer mug! Awards info can be found HERE. One additional highlight is that organizers are supporting Second Harvest Food Bank by asking each athlete to bring a canned or other non-perishable food item to the event to assist with Thanksgiving Food Baskets for those in need. Have any doubts that an event as cool as the Big Easy Running Festival is possible? It's put on by Premiere Event Management, the group that brings you the Shamrockin' Run 8K Road Race, Ochsner Ironman 70.3 New Orleans, New Orleans Triathlon, and other events across the nation. I think their track record speaks for itself. I can't wait to see what they have in store for us come November 23rd! Visit the official Big Easy Running Festival website HERE. The complete press release about the Big Easy Running Festival can be found HERE.